John King’s technique is characteristic of the painterly, workmanlike style of representational art from the years after the Second World War. In this respect his paintings are related to the work of Martin Bell (q.v), who was also a teacher (at the Liverpool City School of Art) a couple of decades earlier than King. This style is characterized by its matt finish and – often – a use of chemical greens. 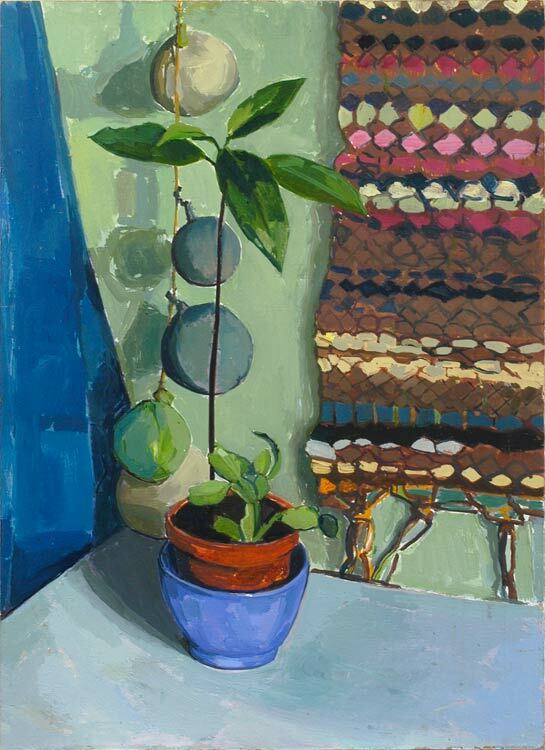 King has created an almost abstract composition here, which plays with a spectral array of greens: from the diagonal panel of teal on the left to the fresh yellowy green of the Christmas cactus sharing the avocado’s pot. An unusual and decorative work. John King was born in Grimsby in 1946, and left school at 15 to join the Grimsby School of Art in Silver Street (three years after the actor John Hurt joined the school). After completing his diploma he worked there briefly as a technician; he then attended the Royal College of Art from 1968-71, completing his MA alongside alumni such as Glenys Barton, Terry New and Sasha Kagan. He then studied and worked in conservation, and copied paintings and murals whilst touring the Continent. One of these last works was an important copy of Cimabue’s Crufix. He was influenced by the work of Piero della Francesca, Turner and Constable, although he was friends in the present day with the rather less Old Master-ly figures of Euan Uglow and Patrick Simons. From 19786 he taught at a Dorset art school, moving later to teach at Salisbury College of Art and Design.